Does a Species of Giant Ground Sloth still exist in the Amazon Rain Forest? I’m not impressed with the science credentials and logic of most cryptozoologists such as Loren Coleman. Bigfoot is a man in an ape suit. The famous film footage shot in the 1960’s is not of some unknown species of ape, but rather of a Hollywood stuntman in an ape costume. The stuntman, Bob Heironimus, took a lie detector test on a television talk show, and the test showed he was telling the truth when he confessed to being the man filmed in the ape costume. Still, Bigfoot believers (like Christian fundamentalists who believe in a literal translation of the bible despite the facts) refuse to accept that the film is a fake. There may be a great deal of wilderness left in the Pacific northwest but it’s not so remote that a population of a gigantic species of ape could survive undetected following expedition after expedition. However, the same can’t be said for parts of the Amazon jungle where there are still whole Indian tribes yet to be contacted by Western civilization. The Amazon rain forest is so vast there is a remote possiblity that a large mammal species unknown to science may still live here. Photo from google images. I’m skeptical that a large mammal is yet to be discovered here, but it’s much more plausible than the existence of Bigfoot in the Pacific northwest. The locals description of an animal they refer to as Mapinguari sounds just like a 3-toed giant ground sloth. They say it is large, has long arms, red fur, long claws, and leaves foot prints with 3 toes. Pat Spain of the National Geographic Series, The Beastmaster, interviewed a man who even claims to have shot and killed one, and his description of the event is consistent with what one would expect from an encounter with a ground sloth. The hunter reported that his gun shots to the body had no effect, but eventually he killed it with a shot to its head. This makes sense (if it actually happened) because ground sloths had armor, like their close relatives the armadilloes, under thick fur that could perhaps protect them from bullets to the body. Pat showed the hunter pictures of various mammals, and the hunter pointed out an illustration of a giant ground sloth as the animal he killed. However, he didn’t save any part of the animal because supposedly it smelled horrific, making his story doubtful in my opinion. A poor Indian would surely understand the value of an unusual animal, particularly the monetary reward he could get by selling it to science. 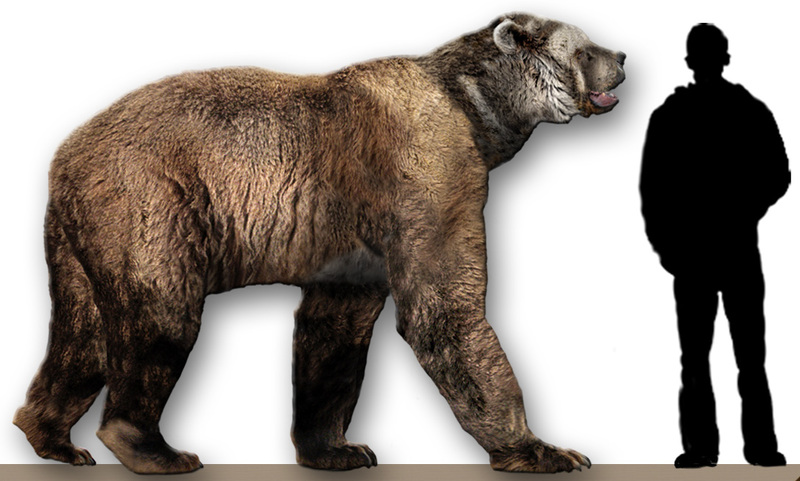 Illustration of Harlan’s ground sloth from google images. The creatures the natives in Brazil describe sounds like a mylodon type of giant ground sloth. Harlan’s ground sloth was the species of mylodon sloth that lived during the Pleistocene in southeastern North America. Without positive physical evidence I remain doubtful that it is still extant even in the Amazon rain forest. If the locals are telling the truth though, some interesting characteristics of giant ground sloths have come to light that we could never gain from just their skeletal remains. Apparently, giant ground sloths move together with herds of the vicious white lipped peccary. Perhaps, they forage on the same plant species and mutually attack predators for the Indians claim the sloth is the peccary’s protector. Fruits and leaves brought down by the sloths when they tear trees apart may be a convenient source of food for the peccaries as well. The sloths also have an odor that is said to be incapacitating, making for an additional defense mechanism besides their size, armor, and claws. 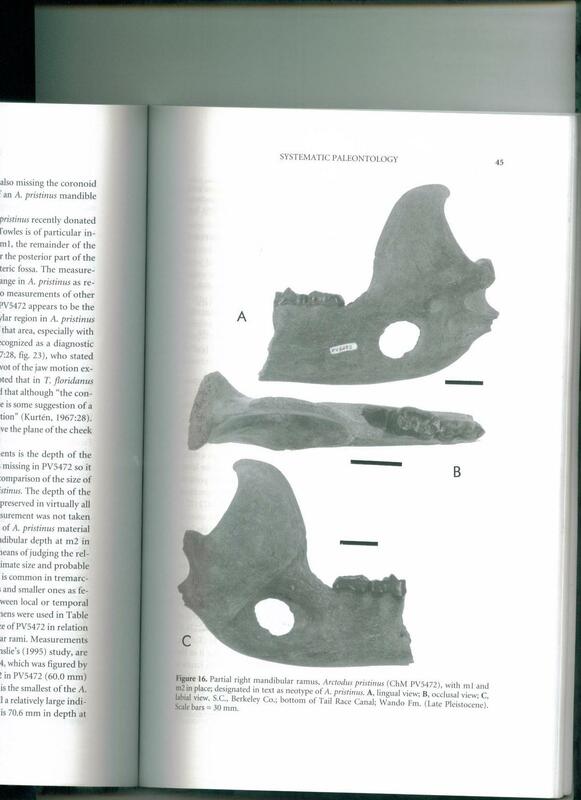 If it exists, it is probably a mylodon species of sloth related to Harlan’s ground sloth which used to inhabit southeastern North America during the Pleistocene. Pat suggested stories among the natives of the Mapinguari may be legends passed down from actual encounters their ancestors made with this animal thousands of years ago. The native people living in this region have had a continued existence here for thousands of years, and perhaps this animal only became extinct 2-3 thousand years ago rather than 11 thousand as science assumed. (See my blog entry entitled “CSI: Pleistocene Alaska.”) And in fact, scientists know that dwarf ground sloths living on Carribean Islands survived until at least 4 thousand years ago, becoming extinct shortly after human colonization. Photo of the Chacoan peccary from google images. This South American species was unknown to science until 1970 and was thought to be extinct for 10 thousand years. New recent discoveries of mammal species in South America would not be unprecedented. Scientists found a population of Chacoan peccaries (Catagonus wagneri), a species thought to be extinct for 10 thousand years, in 1970, though the local natives had been hunting them for millenia and reporting about it to Westerners for years. In the past decade scientists have discovered 10 new species of monkeys in the Amazon. Maybe that’s why a real scientist, ornithologist David Oren, risked his reputation searching for this possibly extant species of ground sloth. If it exists, it is likely in grave danger of extinction because natives from uncontacted Indian tribes still probably hunt them with no restrictions. I like Pat Spain, host of The Beastmaster, because he’s a real scientist (a marine biologist) who seeks rational explanations first before succumbing to the possibility that a reported creature is an animal unknown to science. On one episode for example he traveled to the Congo to investigate reports that a dinosaur-like creature inhabited a remote jungle. He showed pictures to the natives of various large animals, including those of long-necked sauropods. The natives identified a sauropod as the creature called Mkobe Mkembe. But Pat demonstrated that an elephant swimming across a deep river with only its head and trunk showing, closely resembled a sauropod, the trunk looking very much like a long neck, the head having the appearance of an animal’s upper body. On another episode Pat investigated reports of sea serpents off the coast of British Columbia. He suggested a rare fish knowns as an oarfish, Agrostytichthys (sp. ), may be the sea serpent of myth. 3 men holding an oarfish. Photo from google images. This creature may be the sea serpent of myth which means the sea serpent is not actually a myth. They grow larger than this. Pat leaves the door slightly open for the possibility that a giant species of ground sloth still roams a remote region of the Amazon. Pat’s great uncle was Charles Fort, the founder of Cryptozoology and the study of all unnatural phenomena, but the host of The Beastmaster says that he became interested in strange creatures long before he knew he was related to Fort. The Natural Environments of Georgia by the late Charles Wharton is a book I remember reading between classes in the Augusta College library in 1986. Then as now, local ecology and natural history fascinated me. For my recent 3 part blog series about the Okefenokee Swamp, I read a research paper that referenced this book and reminded me about it. I knew this source would provide a great deal of fodder for my blog, so I began to search for it. It’s out of print, and the only copy on sale at amazon.com is a used one for $186 which is about 10 times what I’m willing to pay for it. The east central Georgia library has 62 copies of the book, so I asked for an interlibrary loan. Again no dice–it’s considered a reference book, and they don’t loan it out. Finally, I went out of my way to the downtown library to look at it, but I only had an hour. I had to cram the 200 page book into my brain instead of being able to digest the interesting details at my leisure. Research shouldn’t be this hard. Dr. Wharton lists 100 different types of natural environments in Georgia, but this is an arbitrary and somewhat redundant list. A new version of this book (which was originally written in 1979) is due from the University of Georgia Press within the next 2 years, and they list 72 types. The new version will be entitled A Guide to the Natural Environments of Georgia, and I expect it to be an expensive volume. Many of the plant associations found in these myriads of environment types probably date back well into the Pleistocene and perhaps earlier. Certainly, some Pleistocene plant associations no longer exist. Part of north Florida once consisted of a forest of spruce, beech, and hickory, a combination of trees now found nowhere in the south, at least naturally. A plant fossil site near Winder, Georgia known as Nodoroc suggests a forest of northern pines (red and white), southern pines (shortleaf), and oak along with hickory, chestnut, and fir, and interspersed with many grassy meadows–another environment not found today. All forest types including the extinct Critchfield’s spruce as a component, of course, no longer exist. Critchfield’s spruce was a temperate species once widespread in the southeast. The composition of plants within an environment depends on many factors, chief among them is chance. Many plant species have a wide tolerance for different climates and soil conditions. Some compete better than others according to environmental conditions, but still dumb luck plays a big role in the distribution of different kinds of plants. For example wind blows seeds of one plant in one direction creating a pure stand here, but it didn’t blow in the opposite direction making that plant absent there. A series of annual freezes destroys the fruits of a tree, wiping out that species here, but not there on a sunny southern facing slope. Fire burns up a forest transforming it into a meadow here, but leaves a stretch of wood there on the other side of a stream. Animals consume all the acorns here allowing beech which can reproduce from sprouts to dominate, but over there a score of acorns go uneaten and a lot of oaks still grows. I’ve already discussed open pine savannahs and cypress swamps in previous blog entries. Here are a few other types of environments Charles Wharton catalogued in his book. I’ve focused on common environments of central Georgia. Dr. Wharton states this type of environment made up about 9% of Georgia’s landmass. Common trees included river birch, sycamore, sugarberry, green ash, red maple, box elder, water hickory, and oak. Stands of water, cherrybark, overcup, and swamp chestnut oaks outnumbered stands of just water and willow oak. Thick stands of giant river cane or bamboo forming impenetrable thickets occurred at the heads of creeks. These were rich environments providing lots of forest mast and bamboo forage for the megafauna to eat. Bison and mammoths could graze year round upon the cane which is a giant grass, and munch down on acorns in the fall and winter as well. Early naturalist explorers such as William Bartram and John Lawson found canebrakes that stretched for miles. The Indians maintained them with fire. Now, canebrakes exist as small patches vanishing in the face of development and fire suppression. Disjunct populations of plant species that normally range in the north exist along the Mississippi River in southern Louisiana. Ecologists theorize that during the last Ice Age cold meltwater from midwestern glaciers rushed down the mighty Mississippi and hit warm southerly fronts creating foggy moisture which got trapped in river valleys with steep bluffs. These blufflands host beech, shumard, white, and chinkapin oaks, tulip, magnolia, elm, basswood, mulberry, Florida sugar maple, pignut and bitternut hickory, white ash, hackberry, sycamore, holly, spice bush, paw paw, hydrangea, silver bell, red bud, hop hornbeam, elderberry, giant bamboo cane, 11 species of fern, nettles, ginseng, and many other plants that prefer cool moist conditions. 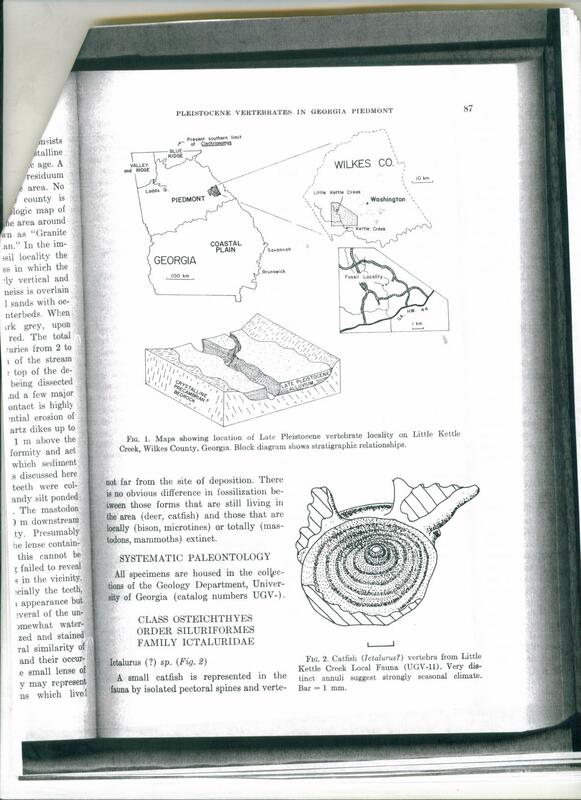 Such bluff forests are also found on the Atlantic coastal plain as far south as north Florida suggesting a similar climatic explanation here as well, though no rivers in what is now Georgia drained directly from glacial meltwaters. Soapstone outcropping in suburban Atlanta. This land was never farmed because it was too rocky, and a good example of oak-hickory-pine climax forest grew here. The Woodland Indian culture carved bowls into the stone before the development of ceramic pottery. Picture from google images. This type made up 50-75% of the Georgia piedmont before European settlement. Dr. Wharton gave 2 examples: one in Elbert County and the other in Dekalb County. The latter is known as Soapstone Ridge. People from the Woodland Indian culture (3000-1500 BC) chipped bowls in the abundant soapstone located in this region which is right off the Atlanta bypass. They heated stews by dropping hot rocks in the bowls. The development of ceramic pottery put an end to this practice. The chipped bowls are still visible in many rocks. The rocky soils prevented the development of agriculture, but now a subdivision known as Soapstone Ridge (what else?) has fragmented the forest. These forests hosted red, white, and black oaks, pignut, shagbark, and mockernut hickories, shortleaf and loblolly pines, and red maples. Formerly, before the blight decimated the species 100 years ago, chestnut was a common component. Soils within this region containing high levels of iron and magnesium also host Oglethorpe oak, mulberry, basswood, and redbud. Regions within the oak-pine-hickory climax type that are continuously burned become dominated by fire resistant pines. This is an extremely rare type within the oak-hickory-pine climax type that was probably more common during the Pleistocene when dry cycles of climate created a landscape of widely spaced shortleaf pine, red, scarlet, post, and blackjack oaks, blueberry and haw bushes, and grass. Today, this type of environment only occurs on thin soils. Photo by Karan Rawlins from google images. This is a beaver pond somewhere in Georgia. Without humans limiting their numbers, beavers dammed most of the abundant creeks in what is now central Georgia creating long chains of beaver ponds. 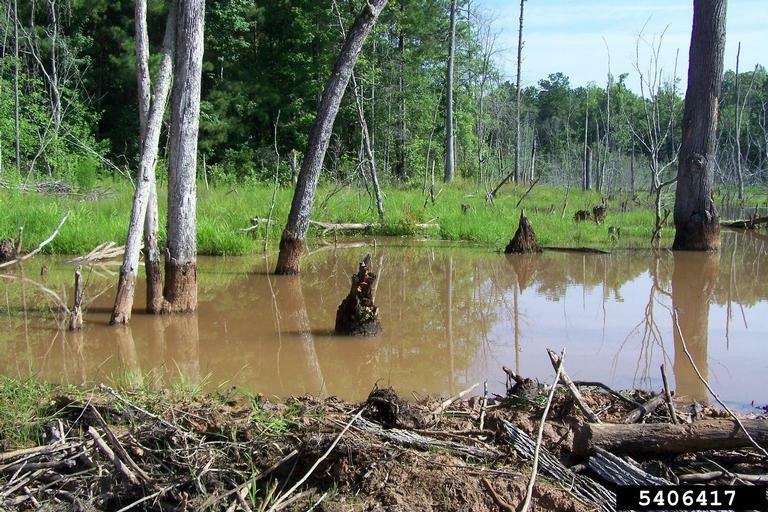 If beavers completely chewed down all the trees in a vicinity, they abandoned the area and sediment filled the ponds until the ponds transformed into a marsh. After enough willow trees resprouted the beavers would return. Treeless marshes were the preferred habitat of the extinct giant beaver. Therefore, it’s reasonable to suppose that the present day beaver (Castor canadensis) created habitat favorable for the extinct giant beaver (Castor ohioensis). Beavers don’t build dams on large rivers but instead live in riverside tunnels. When trees grow scarce, they will dig canals connecting their home pond with distant woodlots. Dr. Wharton’s book has a neat aerial photograph of a chain of beaver ponds along a tributary of the Flint River. A hunter told him that one of these ponds alone held 1000 ducks. King rails and Virginia rails, both of c0nservation concern in the state, live here. Pickerel, buffalo fish, bowfin, and many other fish species swim in this pond–if it still exists. Remember, the book is 30 years old. An area in the piedmont stripped of its trees will soon become a grassy field with annual flowers. If stripped of soil too, a stage where moss grows and soil builds will occur. During the Pleistocene, megafauna foraging and fires probably prolonged the grassy meadow stage. Next, perennials and pine tree and sweetgum seedlings, their seeds windborne, begin to take hold. Berry bushes too, their seeds carried in bird turds, form colonies. Pine trees grow quickest and dominate while oaks try to catch up. Eventually, oaks and hickories shade out the pines and they dominate. Shade tolerant trees such as maples are the final colonists. A mature piedmont forest was something beautiful and awe-inspiring, according to William Bartram who saw much of Georgia before Europeans ruined it. 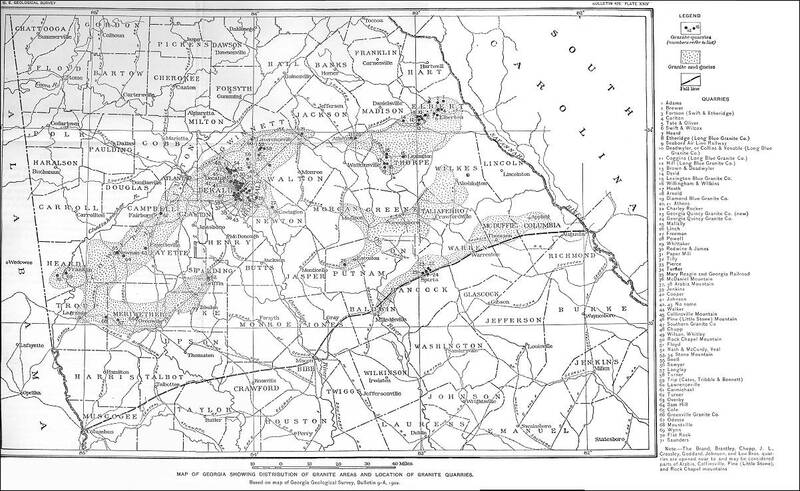 1902 map of granite outcroppings in central Georgia. Some rare plants live in shallow solution pits in this type, but mostly they’re just bare rock. Below is a link to a virtual tour of Heggies’s Rock in Columbia County, Georgia. In my opinion the surrounding woods are much more beautiful than the naked granite. There are sandstone outcroppings in the coastal plain. Little Kettle Creek excites me because it is the closest Pleistocene fossil site to where I live. It is the only known Ice Age fossil site in the entire piedmont region. Bogue Chitto Creek in Alabama is in the northern coastal plain, and Ladds in north Georgia is in the southern ridge and valley, so there are other fossil sites close to this geographic region, but Little Kettle Creek is the only one actually in it. Its discovery 40 years ago sparked hopes that it would lead to discoveries of more sites in the region but that hasn’t happened. But I believe it can’t be the only one and some day I hope to find another piedmont fossil site. The word, kettle, is a derivative of kittle which is an archaic word for fish trap. In the days before supermarkets Indians and early pioneers likely laced the creek with fish traps for easy suppers while they were busy clearing land and working in the fields. A Revolutionary War battle fought here demoralized the British, so the area has plenty of interesting history, despite being off the beaten path–the county population is a mere ~10,000 and early town leaders rejected the development of railroad lines through here because they considered trains “faddish, noisy, and dirty.” Eventually, railroad lines were built, but by then, the rest of the state had passed this county by. Location of the Little Kettle Creek fossil site. From a copy of the below referenced paper. 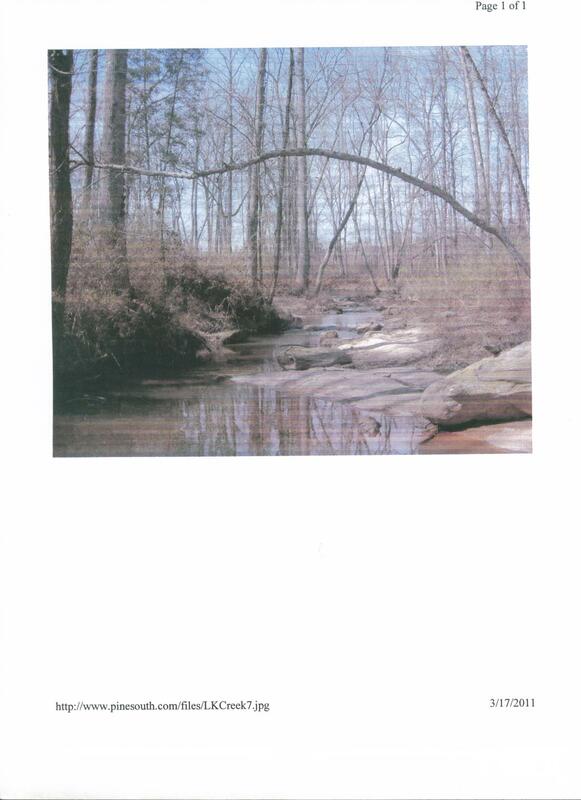 A photo of Little Kettle Creek on property for sale. This photo is probably a few hundred yards downstream from the fossil site. Fossils were found in sediment accumulated behind granite dikes like those seen in this photo. I found land for sale near this site. For $235,000 one can buy 65.12 acres of nice timber land where he/she can hunt deer and dove, fish the creek, and prospect for fossils and artifacts. However, the only building on the site is an ancient barn. It may be heaven for me, but my wife doesn’t appreciate the lack of amenities. Most of the fossils were discovered in an accumulation of sediment trapped behind a granite dike similar to those shown in the photo above. The son of the then property owner discovered a partial mastodon tooth 100 yards downstream from the dike but all but one other specimen were found behind the natural rock dike. The whole area is underlain by pre-Cambrian age granite which is eroding at different rates. This accounts for the uneven distribution of the granite outcroppings. Pleistocene sediment overlays this. I’ve thought about this for a long time and believe the creek must cut through a large undiscovered Pleistocene deposit farther upstream from the site. The fossils washed downstream (and may still be periodically washing into the same dike) to become lodged behind the rocky impediments. Dr. Voorhies and his students scoured the area for fossils and found specimens of 7 species. Here’s the list. The catfish bones show growth rings similar in size to those from fish that live in midwestern states where fish stop growing in the winter. Fish in modern day southeastern states don’t show these size growth rings. That means the climate at the time these fossils were living creatures must have included colder winters than those of today in this region. I’m planning a trip early this summer to visit Wilkes County. In addition to the fossil site, the Revolutionary War monument is worth seeing, and I’m curious as to whether I can find William Bartram’s “Great Buffalo Lick,” which reportedly an historian has determined is nearby. Of course, I’ll recount the day trip on this blog. Extant species of amphibians not only survived the Pleistocene, but ancestral species withstood environmental changes that occurred in the Pliocene, Miocene, Oligocene, Eocene, Paleocene, Cretaceous, Jurrassic, and Triassic. They may be physiologically primitive, but they’re adaptable. Part of their ability to endure gross environmental change may be their habit of becoming dormant during unfavorable conditions such as drought or cold weather. Amphibians can burrow into mud or forest litter, under rocks, or at the bottom of a pond and are thus protected, even if the atmosphere cooks following an extraterrestrial impact. Amphibian fossils of extant species occur in some Georgia fossil sites. Cavers and scientists found and identified 17 species of amphibians in Kingston Saltpeter Cave, Bartow County. Amphiuma fossil bones associated with mammoth and bison fossils were among the treasures of the Clark Quarry fossil site near Brunswick. 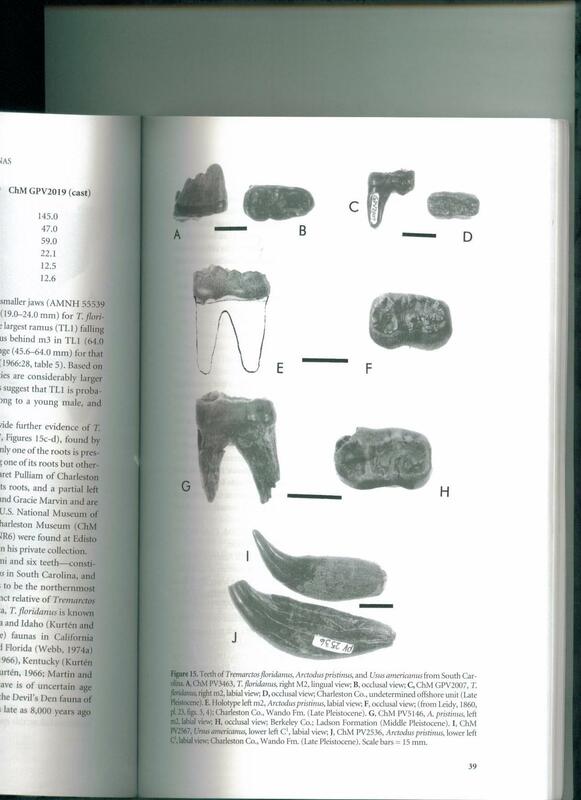 Numerous fossil localities in South Carolina’s coastal plain, some dating back to the Pliocene, also are home to amphiuma fossils. Incidentally, genetic tests determined all 3 amphiuma species descend from an ancestral species that lived 4-10 million years ago. While reviewing existing amphibian species in Georgia along with the Pleistocene fossil record, I didn’t gain any surprising ecological insights, as I frequently do with mammals and birds. Not many, if any, amphibian species in Georgia became extinct at the end of the Pleistocene. However, the fossil record is incomplete, and therefore deceiving. Reference sources on this subject are limited to a difficult to obtain academic book written by the late Alan Holman, but I’m pretty sure amphibians didn’t take the big hit that the Pleistocene megafauna did. In any case it’s obvious that western spadefoot toads were once a continuous population with the eastern spadefoot toad. Speciation probably occurred some time during the early Pleistocene. And northern leopard frogs must have had a more southerly range because their present day range was under glacial ice during the Wisconsinian Ice Age. Here’s a review of every known amphibian species in Georgia. —Also known as devil dog, it’s restricted to fast moving mountain streams here in Georgia. A Japanese cousin of this species grows to 5 feet long. Wow! —During droughts, these eel-shaped creatures encase themselves in mud and become dormant. They “yelp” when captured. They’re restricted to the coastal plain in state. The eastern is interspersed throughout the state. Mudpuppies live in mountain streams; Alabama waterdogs live in the western part of Georgia; dwarf waterdogs live in the southeastern part of the state. The species that lives in Georgia can grow to almost 4 feet long. These slippery, eel-shaped animals, bite when handled. Photo from google images. Note the vestigial limb. —The flatwoods salamander lives in wet pine savannahs and is often found in crayfish burrows. –Jefferson’s salamander doesn’t currently live in Georgia but may have occurred here during the Ice Age because most of its current range was under glacial ice. –Spotted salamanders live underground on forested hillsides near pools of water. –Marbled salamanders lay eggs when their nests fill with rain water. — Tiger salamanders frequently are found in my yard. They feed upon insects, worms, mice, and other amphibians. —Southern dusky salamander can change color like anole lizards. –Black bellied salamanders originally were restricted to the mountain region, but their use as fish bait has expanded their range to include an irregular inhabitation of the piedmont. –Cave salamanders have a prehensile tail and forage in cave crevices. –Georgia blind salamanders live in ground water in southwest Georgia. –Slimy salamanders secrete a glue-like substance difficult to remove. Photo from google images of a Georgia blind salamander. They live in well water. –This animal can survive light brush fires. —Bullfrogs eat birds, mice, other frogs, crayfish, insects, and minnows. Their croak sounds like a cow lowing. Photo from google images of a bullfrog. –Green frog croaking sounds like a banjo twang. –Pig frog croaking sounds like pigs grunting. –River frogs and pickeral frogs have a toxic skin secretion that repels snakes. –Southern leopard frogs escape predation by leaping into the water, making a sharp right turn, and emerging in vegetation close to shore. –Northern leopard frogs no longer occur in state but I suspect they did during the Ice Age. –Wood frogs live as far north as Alaska where they survive being frozen in winter. In Georgia they live in the northern part of the state. –Carpenter frog croaking sounds like the hammering of carpenters. –The narrow-mouthed frog’s croaking sounds like a sheep bleating. –The southern toad likes sandy soil in oak scrub habitat. –Pine forest tree frog croaking sounds like a chorus of typists. They live at the tops of trees in open pine savannahs. Photo from google images of a pine forest tree frog. –Barking tree frogs have scattered relic populations. They probably had a continuous range during warm interglacials. –Brimley’s tree frog changes color for camouflage. You are currently browsing the GeorgiaBeforePeople blog archives for March, 2011.